Sorry I have not posted. I have no excuse whatsoever. But look! We are moving! How exciting! We pick up the rental truck tomorrow and will drive part of the way in the evening. It's about 8 hours to Melbourne normally. The plan is to get there Wednesday noonish, pick up keys, unload the truck in a hurried manner, spend the night in the new place, then drive back slowly to Adelaide. Why drive back? Because it costs $560 to rent a truck from Adelaide for four days and return it to Adelaide, but $1600 to rent it for two days and leave it in Melbourne. They even had a Melbourne truck that needed to be returned to Melbourne, but that was still gonna cost us $1100. How does that make any sense? So yeah, we'll be back in Radelaide next weekend. Which is actually handy, because then we can drive Hugh's car over to Melbs and I don't have to drive! Result! Now, back to work, lazy bones. 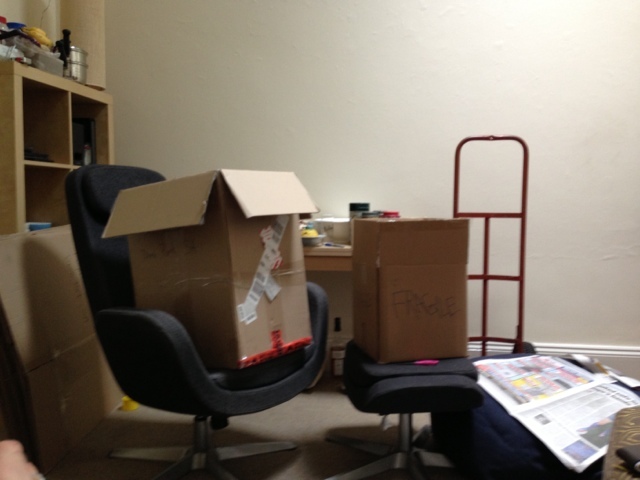 I think moving is a good excuse for not blogging! Good luck with the move. Will this be Hugh's and your first road trip? Be sure to take some Britney, N'Sync, and A-Teens along for the ride. P.S. When you guys come to Seattle, we want to take you to restaurants and go on some hikes. Yes, to all of what B said. Yays! How exciting!!! Do tell me all about Melbourne!!! !